Not everyone’s idea of a dream honeymoon is one that involves the beach, the beach and more of the beach. While beaches in the Caribbean are some of the prettiest in the world, spending a week or 10 days in just a beach destination may not be your idea of paradise. With My Vacation Lady‘s knowledge and expertise, we can help you plan your ideal honeymoon to the Caribbean that includes the experiences that you are looking for. If you look at some of the most popular islands in the Caribbean, you may find that these destinations include a lot more than just the beach. In fact, there are so many things you can do in the Caribbean besides move from the pool to the beach. 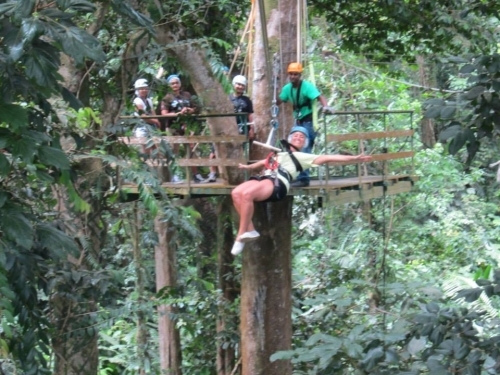 Adventures, Thrills and Chills: Have you ever wanted to go zip lining? Hiking to gorgeous waterfalls, spelunking in caves, biking through a rain forest? Did you realize that you can do all of these activities in Jamaica? Natural Beauty: Have you ever driven into a volcano? Have you ever taken a mud bath in a national park? Have you taken an ATV tour through lush tropical gardens and jungles? You can do all of these and more in Saint Lucia. Visit UNESCO World Heritage sites: there are currently 17 in the Caribbean including Santo Domingo in the Dominican Republic, The Morne Trois Pitons National Park in Dominica, The Pitons in Saint Lucia, forts at La Forteleza and El Morro in Old San Juan, the Brimstone Hill Fortress in Saint Kitts and the town of St George in Bermuda. These sites will intrigue most history buffs. The people of the Caribbean are among the friendliest in the world. They welcome tourists with open arms and are proud to share their culture and their island with visitors. Aruba’s license plates say, it’s “One Happy Island” and it truly is. Festivals– some of the best known Caribbean festivals welcome visitors. How about Junkanoo in the Bahamas in late December? Saint Lucia has a jazz festival every May. Barbados celebrates their Crop Over Festival for the entire month of July. Jamaica hosts the Reggae Sum Fest every July. Curacao hosts the Tumba music festival in January and there are many more. The food – Jerk Chicken is a favorite of Jamaica but the spices and taste of Caribbean food can please even the most discriminating Foodie. Did you know that Barbados has 5 Zagat rated restaurants for 2012? Have we given you enough reasons to visit the Caribbean even if you don’t just want a beach honeymoon? My Vacation Lady can help you decide which Caribbean island may be perfect for your honeymoon. Give us a call or contact us to set up your personal honeymoon consultation. Once you do you’ll realize why My Vacation Lady has earned Wedding Wire and the Knot’s top awards!